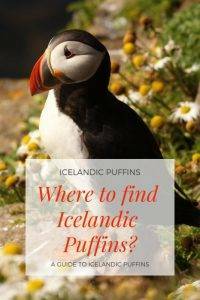 Want to know where to see puffins in Iceland! Iceland has many natural wonders and an abundance of wildlife but one of its most well-known animals is the Atlantic puffin or puffin bird. The Icelandic word for puffin is “lundi” and one of the treasured birds of Iceland. Iceland is well known for having one of the largest puffin colony and populations in the world. With over 60% of the world’s puffin population, the black and white birds burrow nest all around the country and it’s surrounding islands. Around an estimated five million puffins (numbers are declining) visit Iceland every year during spring and summer to nest and lay puffin eggs. Every year each female produces one puffin egg. By the end of the summer, the little puffins leave the nesting area and return to the ocean. A baby puffin is called a pufflin and when they leave they their puffin nest they are approximately one and a half months old and venture out into the ocean for the first time. In the autumn and winter months, the birds live together in large floating colonies in the Atlantic Ocean. Puffins mate for life and return to the same nesting spot each year. Puffins live on small fish such as capelin, sand lance, herring and hake, as well as zooplankton. They are also strong swimmers and can fly up to 55mph. Back on land, the puffins dig burrows between 70 – 110 cm long with their feet and bills. They like to dig these burrows as close to rocks and steep cliffs as they can, which makes Iceland the perfect place for them to nest, with its large rocky shoreline and coastal cliffs. There are three types of puffins Iceland has, the Atlantic puffins, horned and tufted puffins bird who live in the Pacific Ocean. 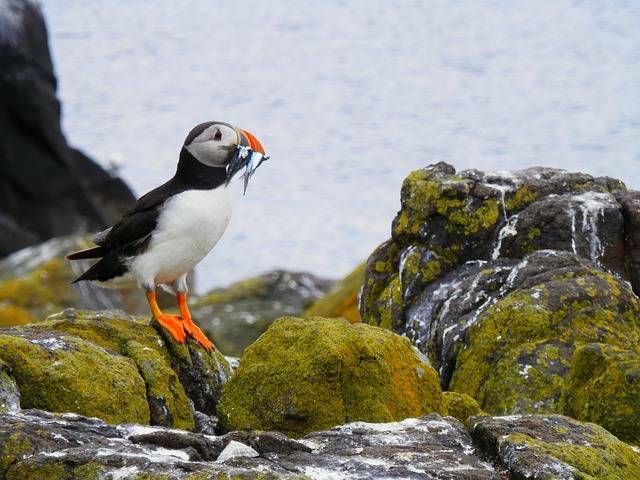 Iceland Puffin Season – What time of year can you see puffins in Iceland? The puffin season Iceland is the best time to see Atlantic puffins between April and September. While visiting Iceland, the best time of day to see puffins is between sunrise — 11am and between 6pm — sunset. The birds spend a large amount of the afternoon out to sea, meaning visitors can see the birds on land or out to sea on a boat trip. Visiting Iceland in June? 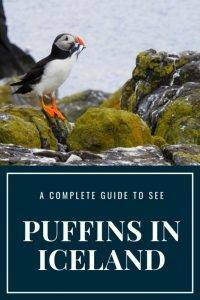 Check out my guide to the top 13 things to do there including seeing the puffins! Puffin numbers are declining not just in Iceland but around the world, this is due to a number of factors including, a decline in food sources such as sand eels (rise in sea temperatures are to blame), overfishing, hunting, pollution, and extreme weather conditions. All these factors lead to an increase in fishing time for the puffins and an overall decline in numbers. According to many environmental groups and organizations, puffins are considered an endangered animal. The collection of 15 islands named Vestmannaeyjar, located just off Iceland’s coast, is home to less than 5,000 residents. It is well known for having one of the largest puffin colonies in the world, and the puffin is the community’s emblem. In Vestmannaeyjar Iceland puffins arrive in the summer to mate, where they form the world’s largest colony with over 1.1 million puffins laying their eggs on the islands. Recently the bright lights of the towns and cities have drawn in the young puffins, who are confused about which way they are heading. A number of local residences have begun to collect these puffins and release them back into the ocean. 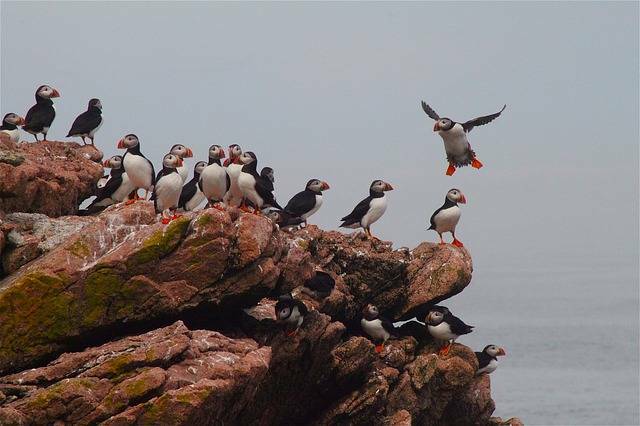 Visitors can see and visit the puffins on a boat tour or alternatively take the ferry to one of the islands, to explore. This is the best place to see puffins. Want to know where you can photograph puffins in Iceland? I would choose Vestmannaeyjar as it is the largest colony in the world. 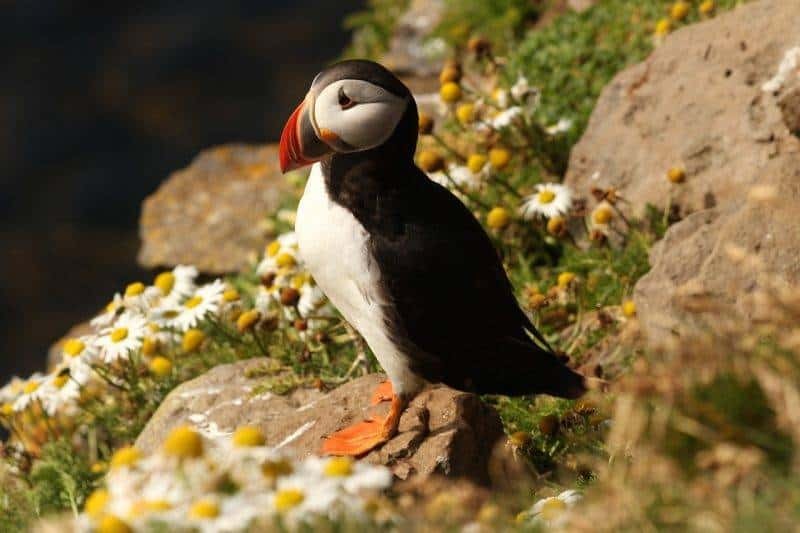 The Lundey and Akurey Islands are the closest places to Reykjavik to see puffins, you can take a short boat trip from the cities Old Harbour to the islands. Lundey and Akurey are uninhabited islands which offer peace and quiet for the puffins to inhabit. These islands are protected areas and visitors are not allowed to step foot on the islands but you can see puffins from a boat trip. Visitors can combine this boat trip with one to see whales and other wildlife in the same area. Remember, Lundi is puffin in Icelandic. A puffin is one of the wild animals in Iceland. Can you see puffins in Reykjavik? 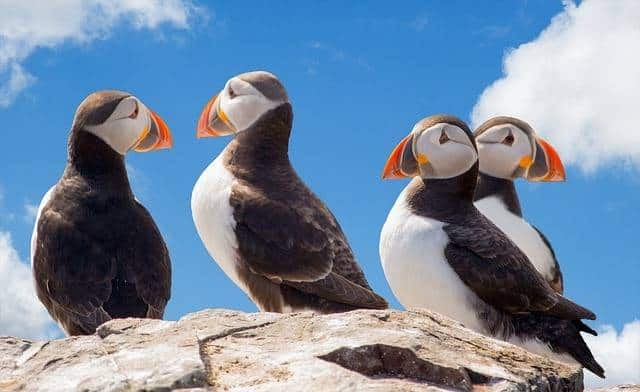 Puffin colonies are not found in Reykjavik but the Lundey and Akurey Islands are the closest place to see them and you can take tours from Reykjavik to there. Boat trips to the island can take as little as 15 minutes, on these boat trips you can see puffins along the rocky shorelines. Boats will go close to the shoreline and expert tour guides can help find puffin nests and they have great knowledge of common places where the birds nest and at which times of the day and month. These guides will also be knowledgable on where to spot other wildlife and marine life on a boat trip, including whales and birds such as northern fulmars, gulls, arctic terns, and black guillemots. Látrabjarg is located in the cliffs in Westfjords. Here visitors can get close enough to the puffins to take great close up photographs of the animals. Be warned not to get too close to the puffins, or disturb their natural habitats, they are wild animals and their burrows close proximation to the cliff edges also make it dangerous for walkers, who get too close to the cliffs. Puffin research tells us that adults can grow up to 18 cm tall and can weight up to 500 grams. They are relatively tame animals, so will allow you to get in close proximity to them to take unique and wonderful photographs. But be warned they are wild animals and can bite if they feel threatened. From Westfjords you can sail to Vigur Island, which is an island inhabited by only one family. 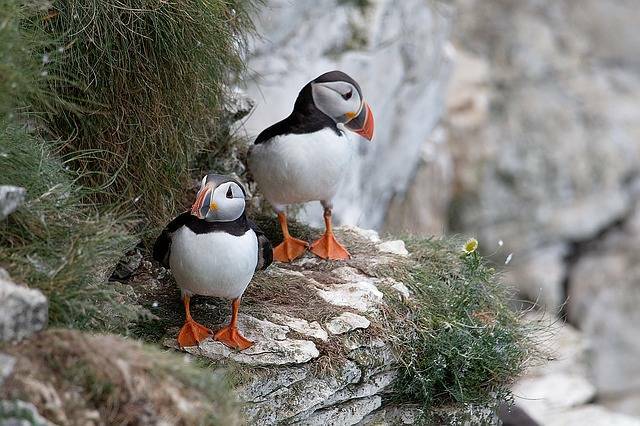 The puffins descend to the island to lay their eggs, approximately 100,000 puffin couples visit the island every year. The island is around two kilometres in length and is a great place to see puffins who return to the island each and every year. Here you can also see a variety of other wildlife and bird species such as the black guillemot, Arctic terns, and eider ducks. Visitors can access the island by boat either with a tour guide or whiteout one, depending on preference. The family who inhabits the island serve refreshments and visitors can send a postcard at Europes smallest Post Office. The south coast of Iceland is very popular with tourists all year round. People visit the coastline for the black sandy beaches around the town of Vik, the stone arch of Dyrhólaey, and the bright green meadows. Dyrhólaey as well as being a great tourist destination is also a great place to see puffins. The green meadows are home to a large variety of birdlife, and there are well-marked walking or hiking paths. 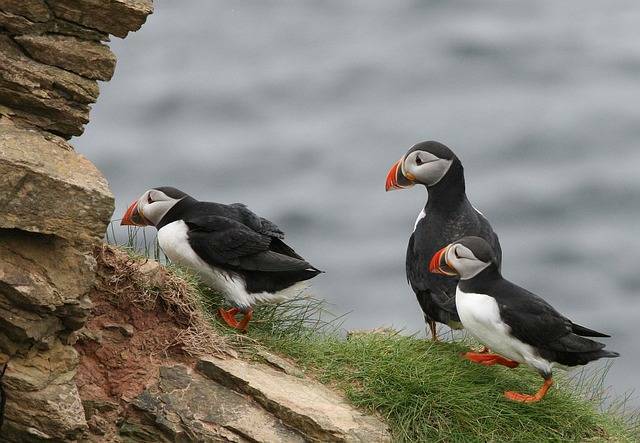 Visitors can walk along the paths and witness different bird species as well as puffins. In their own time. Visitors should be prepared for the weather and check the forecast before taking a trip to visit the puffins. When paths are provided in areas they should be stuck too as they have been made for a purpose, to protect both the wildlife and surrounding environment. Located in north Iceland Tjörnes is a geological marvel, with over four million years of volcanic activity, shown within the multicoloured layers of the cliffs. Fossils in the area also date back to over two million years old, along with lots of places to explore and walk around. There is a lighthouse, Hringsbjar in the East is a viewing platform to see puffins, in their natural environment. The island of Grimsey is located in the northernmost point of Iceland, and the arctic circle crosses through it. The island has less than 100 permanent residence, many of which are fishermen, but it is also home to the Arctic puffins and millions of other birds. Visitors can catch the ferry to the island three times a week and it only takes three hours to get from the mainland to the island. The birds which visit the island during the spring and summer often live within the high cliff tops and vast green lands. The island is a great place for birds to live and fishermen due to the rich fishing waters, surrounding the island. Located on Iceland’s south coast is Ingolfshofdi, a large area of cliffs with rich vegetation, and protected from the elements. Ingolfshofdi can only be accessed by crossing sand dunes, but it is a great spot to see puffins. The area was named after Ingolfur Arnarson, who was one of Iceland’s first settlers in the area. Ingolfshofdi still has an old lighthouse, as well as deserted fishing huts, to visit and explore, along with the puffins and other wildlife species. Papey is an island in the east of Iceland, which can be reached by boat from Djupivogur. The low-lying island is approximately two kilometres squared and deserted to the full-time residence as it has been since 1948. The islands remote location and lack of people make it a great place for puffins to nest and burrow to care for their young. Papey is a great place to see a variety of birds as well as seals and other wildlife. The boat trip takes approximately 50 minutes from Djupivogur. The island used to the house one farm and church in 1902, which were inhabited by Irish monks. You can learn all about the history of the island and visit the old wooden church. 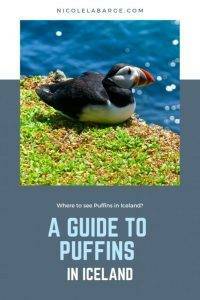 Iceland Puffins Characteristics and Puffin Behavior – Can Puffins Fly? One questions people ask is “Do puffins fly”? Yes, puffins can fly. They live part of the year in the water and fly back to land to nest. 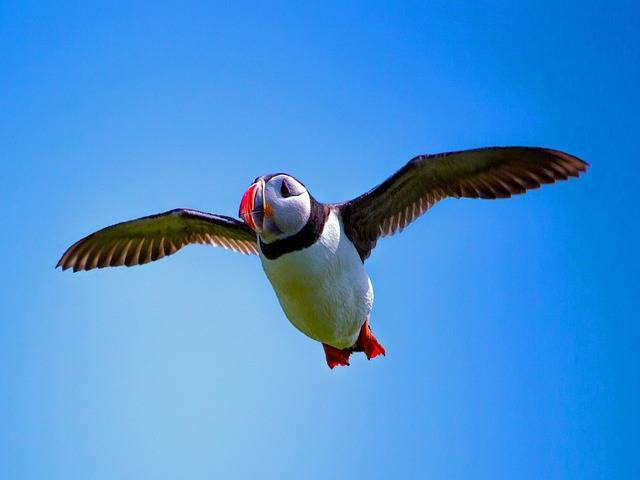 Check out these photos of a puffin flying. How cute are puffins flying? What does a puffin look like? How big is a puffin? Can you have a puffin as a pet? Puffins are black and white birds with a red beak. A puffin weighs anywhere from 500 gram to 900grams (1-2 pounds) and is 18 cm tall or 10 inches. Eating puffin in Iceland is a tradition. Puffin eating is not encouraged though as they are declining rapidly. The traditional delicacy is the heart which is eaten raw. The meat of the puffin bird is smoked to taste like pastrami. Please do not eat Puffin while in Iceland. 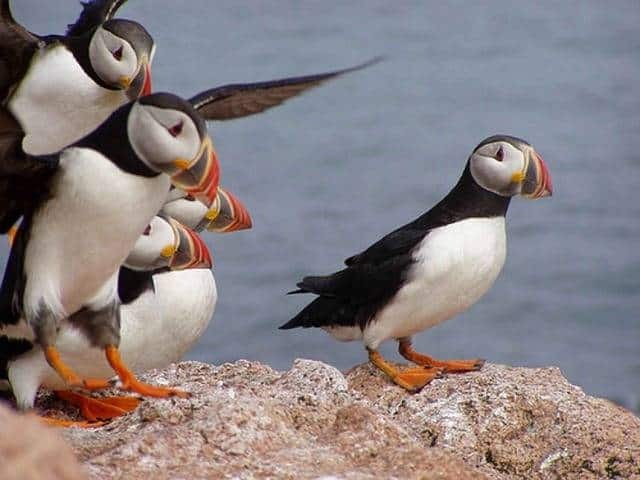 Visitors can see puffins with or without a tour guide, there are many Iceland puffin tours that use a tour guide and they can if they wish to combine it with a whale watching trip, hiking or birdwatching tour, depending on preference. Visitors can also visit Saeheimar, Heimaey Natural History Museum and Aquarium, located in Westman Islands, where they take in puffins who cannot survive in the wild. Remember that it is important not to touch the puffins, not to get too close to them (they bite), and not to endanger their young. Puffins often make burrows close to the cliff edges. So avoid getting too close to the bird cliffs Iceland or you might fall off. Obey signs and warnings, where possible stay on marked trails and platforms. The idea is to make as little impact as possible on both the environment and the puffins. Visitors should leave only footprints and protect the puffins and environment for years to come. Puffins can be found all around the world but Iceland is one of the best and easiest places to see them in the wild, in colonies and nesting. These nine places are the most common and likely places to see the birds, although it is not guaranteed to see them, especially if you visit in April or September. There are no specific dates which the birds arrive or apart from the island, it varies each and every year, depending on a variety of factors. Sharing is caring. Feel free to pin this post to save for later. Oh my gosh — I just love puffins! They are so cute and almost seem cartoonish in their appearance. Plus photos of them always “pop” with their bright orange beaks. I’ve always wanted to go to Iceland; I’ll have to be sure I make time to see the puffins! Seeing puffins in Iceland is on my bucket list! They are such exotic birds. And the best time to visit Iceland for puffins would be summer or spring. Puffins are so photogenic! I saw some in Alaska last year, but didn’t get too good pictures of them. I’d love to see them in Iceland, so if I ever make it I’ll make sure to refer to your post. I didn’t know they live in burrows. My youngest son loves puffins and penguins. I really wanted to visit Iceland to watch the northern lights, but the puffins would be so awesome to see! We saw some in Oregon, but they were so far away we couldn’t get pictures even with a telephoto lens. I will stick to taking pictures of them because they are way to cool for me to want to eat them! Oh they serve puffin meat in Iceland? That’s a pity, especially if their population is declining. I would certainly not want to try it. Puffins look like amazing birds and I would love to see them while I am in Iceland however I will visit in October this year and as per your post, they’re best seen between April and September which is a pity because it means I may not get to see any! Lundey And Akurey Islands sounds like the places I might visit because they’re close to Reykjavik. But I’d be so disappointed if I went all the way and didn’t get to see any puffins. But now I think I know where to go next with my zoom lenses!